Implemented by Futures Institute, the Track20 Project supports national efforts to collect, analyze, and use data to track progress in family planning and to develop effective program strategies and plans. The project works with governments to transform practices that rely heavily on large, national household surveys every few years to a system in which data collected by governments are used to produce annual estimates for key indicators, including modern contraceptive prevalence, commodity security, choice, quality, and family planning expenditures. This approach will make greater use of service statistics and other data collected through the public and private sectors, taking into account their limitations, and will work with governments to install an annual process that reviews the data and issues official estimates. 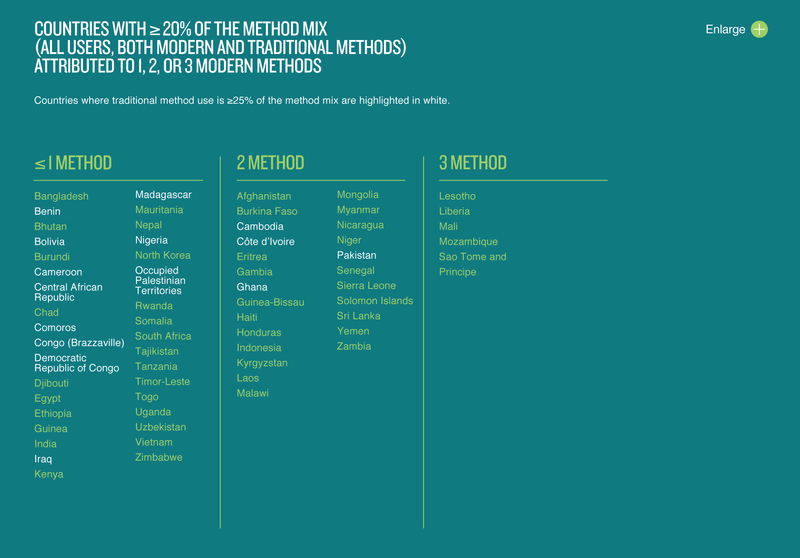 The graphic to the right shows the FP2020 countries in which 20% or more of the method mix (both modern and traditional) is attributed to 0 or 1 modern method, 2 modern methods, or 3 modern methods. The left side of the graphic shows that there is relatively low method mix in many of the FP2020 countries. In almost all countries, only one or two methods represent more than 20% of the method mix. In many of these countries, more than 25% of method use is attributed to a composite of traditional methods. Five of the FP2020 countries have three methods that each represents more than 20% of the method mix. This graphic suggests a possible association between modern method mix and traditional method use: countries with high rates of traditional method use are in higher proportion among the countries with limited modern method mix. 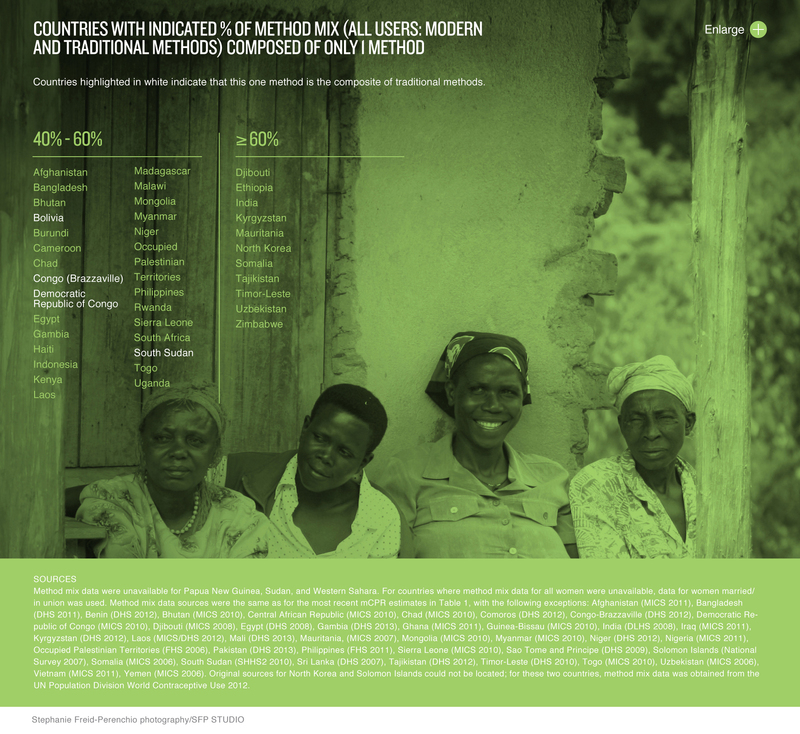 The right side of the graphic shows countries with a large proportion of users using only one method. In this figure, the composite of traditional methods is included in the analysis. The right side of the graphic shows 28 countries (two-fifths of all FP2020 countries) in which 40%–60% percent of contraceptive users rely on one method. For four of those countries, that method is traditional, not modern. The second column on the right side of the graphic lists the 11 countries in which 60% or more of all users rely on only one method of contraception. There are many different reasons why a few methods dominate the method mix in so many FP2020 countries, including access, availability, and preferences. Further research at the country level can help FP2020 countries better understand the needs of women and why some methods are being chosen more than others. By ensuring the availability of a full range of modern family planning methods, FP2020 will play an important role in diversifying the method mix in places where access is limited. Read more on page 88 of the full progress report. Download now. Monitoring family planning expen­ditures is an important means of holding stakeholders accountable for their commitments and to measure progress in mobilizing suf­ficient resources to achieve FP2020 goals. Historically, family planning expenditures have been estimated periodically through special expen­diture studies and national health accounts applications. Building upon successful approaches for tracking expenditures in the fields of HIV/AIDS, malaria, and other infectious diseases, a collaborative effort by Track20, the Kaiser Family Foundation, UNFPA and the Nether­lands Interdisciplinary Demographic Institute, WHO and COIA, and the DELIVER project established a process to comprehensively collect, consolidate, and analyze data that, when taken as a whole, will provide the best possible estimate of fam­ily planning expenditures by country on an annual basis. This effort has already generated some new information in 2013, and estimates in 2014 and onward will be even more comprehensive. Read more on page 90 of the full progress report. Download now.